Maybe it’s my way of shaking off winter, but I’ve been craving lemons something fierce. Their clean fruity brightness convinces me that summer is on it’s way, even if the thermometer outside say otherwise (it snowed again today, very out of character for the end of March in Brittany). 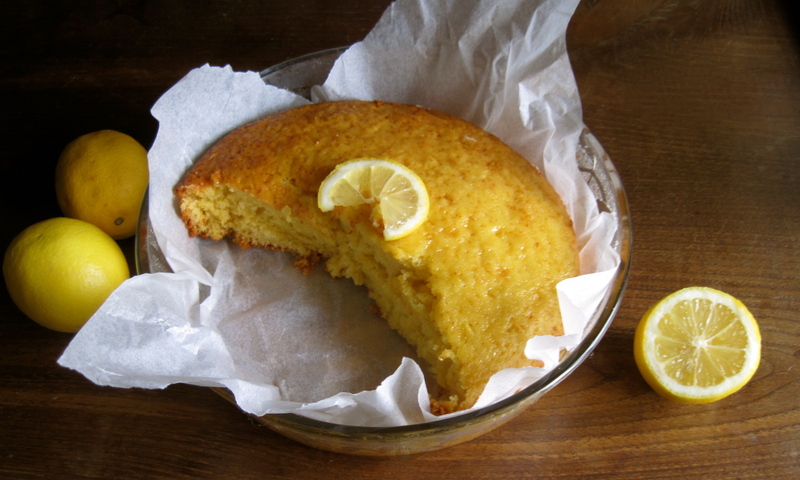 This sweet lemony cake with a hint of honey is the perfect fix for my cravings. Preheat the oven to 180° C (350° F), line the bottom of a round 25-cm (10-inch) cake pan with parchment paper and grease the sides. In a large mixing-bowl, gently combine the yogurt, eggs, sugar, vanilla, oil, honey and lemon juice and zest. In another bowl, sift together the flour, baking powder, baking soda, and salt. Add the flour mixture into the yogurt mixture a little bit at a time, scraping down the sides as you go. Pour the batter into the prepared cake pan, and bake for 30 to 35 minutes, until the top is golden brown and a cake tester comes out clean. Let stand for ten minutes, and transfer onto a rack to cool. Thanks Sinead! Your Cornflake Nests are too cute. They remind me of Rose de Sable, a popular French treat. I love that the boulangeries here have the fanciest tarts and mille feuille in the same case as a humble chocolate cornflake treat.